A home to one of the largest lesser horseshoe bat roosts in Europe has received nearly £100,000 in grant aid. The upper Usk Valley, between Brecon and Crickhowell, is recognised as a nationally "important stronghold" for the rare flying mammal. Funding of £52,000 from the Brecon Beacons Trust and £40,000 from the Heritage Lottery Fund will support a three-year project starting next month. The cash will be used to develop a "greater understanding" of the animal. The project in the Brecon Beacons will be run by the Vincent Wildlife Trust (VWT). It said the upper Usk Valley was an "important stronghold" for the bat, and it included the largest lesser horseshoe bat roost in northern Europe. The funding will be used to employ a part-time officer, to develop volunteers' skills and pay for equipment and educational materials for communities within the project area. 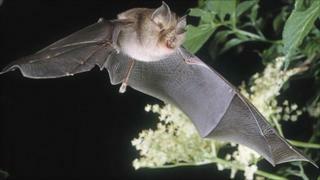 The VWT, an environmental charity with offices in Brecon and Builth Wells, says it will work with the community to develop a "greater understanding of this secretive animal", survey the bat population and improve their travel routes between roosts and woodland. VWT's chief executive Natalie Buttriss said everybody at the trust was "very excited" the project was going ahead. She added: "We have been working in this part of the Brecon Beacons, a very special area for lesser horseshoe bats, since 1995. "Now with the funding in place, we can share our work with local communities and find the missing links in the landscape that once in place will make this area an international showcase for these rare bats." Jennifer Stewart, head of the Heritage Lottery Fund in Wales, said bats were essential to the ecosystem and their dramatic decline in numbers clearly demonstrated the urgent need to protect and understand them. Lesser horseshoe bats are named for their fleshy nose-leaf structures. These amplify the ultrasonic calls that the bats emit when searching for food. Experts say they have suffered a widespread decline in Europe during the 20th Century, although they are now showing signs of recovery. They are found in south-west England, the West Midlands and Wales.